This harness comes with reflective removable patches on each side of the harness. 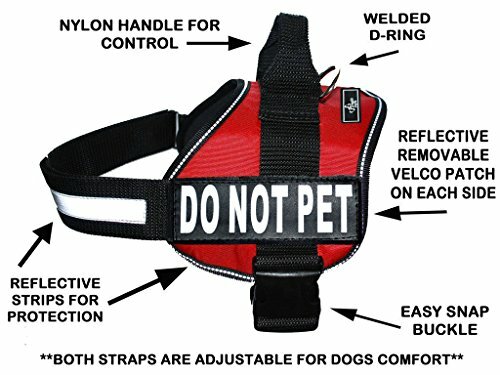 The entire chest strap is reflective and the harnesses entire trim is reflective for your dog's safety. The handle on top gives handler extra control in all situations. It is designed with durable 2 inch nylon. The underside is made of neoprene which adds reinforcement and guards against abrasions like few materials do. A stainless steel heave duty D-ring is located on top of the harness for easy access to your leash. The entire harness is double stitched to add strength for all activities. Two adjustable straps to assure custom fit specifically for your dog. The 2" inch easy snap release buckle makes this harness the easiest harness to put on and take off. If you have any questions about this product by Doggie Stylz, contact us by completing and submitting the form below. If you are looking for a specif part number, please include it with your message.